Carnival Corp. cruises will soon be throwing overboard its wrist bands and keycards for a new kind of wearable tech. Today at the Consumer Electronics Show in Las Vegas, the global cruise brand unveiled a coin-sized chip for guests to wear to access services and receive personalized experiences during their trip. "This little medallion is simple, it's elegant and it's personal," said Carnival CEO Arnold Donald during a Thursday morning keynote. 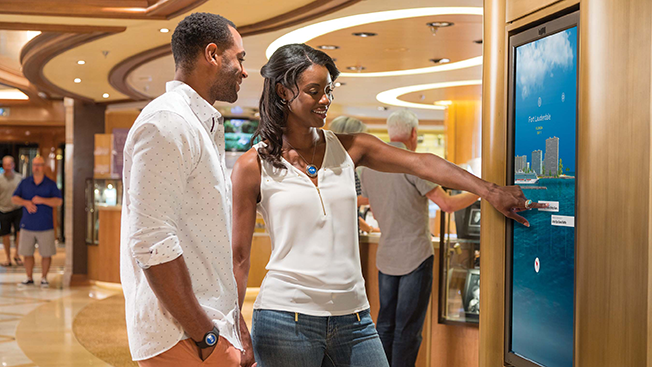 The chip, Ocean Medallion, allows anyone wearing the device to get into their rooms, navigate the ship, order and pay for food and drinks onboard, find friends and family onboard, power gaming experiences and allow crew to create surprises for each guest based on who they are and why they're there. To communicate with the thousands of sensors being installed onboard cruise liners, each chip includes both Bluetooth Low Energy (BLE) and Near Field Communication (NFC) technology for long-range and short-range signals, turning the vessel into a sort of massive mobile device. Guests receive their Medallion in the mail before arriving for the trip, allowing them to personalize their trip and making it easier to navigate airlines and ports along the way. Development of the device was led by Carnival chief experience and innovation officer John Padgett, who led development of Disney's MagicBand that helps visitors navigate Disney theme parks. While the maiden Medallion voyage won't be until November, CES attendees will be able to demo the experience this week in virtual reality with HTC Vive. To show how the devices work, Carnival created a virtual vessel to explore to get a sense of what a hyper-connected boat might be like. "Based on physical and digital and human interactions, we create what we call the 'guest genome' that evolves multiple times per second," Padgett said. "Let's say you're interested in nature so you go whale watching, you're a gamer so you play a few rounds of blackjack, and you enjoy Italian food and wine, the guest genome evolves in real time with hundreds of algorithms running on the edge, creating what we call 'experience intelligence.'"